A Moray business fears that falling out of the EU without free trade deals in place could hit its expansion plans. Forres-based Maclean’s Highland Bakery has been expanding into the Japanese market in recent years to sell its own shortbread, biscuits and oatcakes to Far East consumers. The firm currently relies on a free trade deal between the Asian country and the EU – allowing cheap access to importers. However, now managing director Lewis Maclean fears potential extra costs to continue the supply chain following Brexit could make trading in the country unaffordable, which could force further expansion plans to be curbed. Exports totalling £3.7billion, about 12% of Scotland’s total, are currently sent to nations who have a free trade deal with the UK. 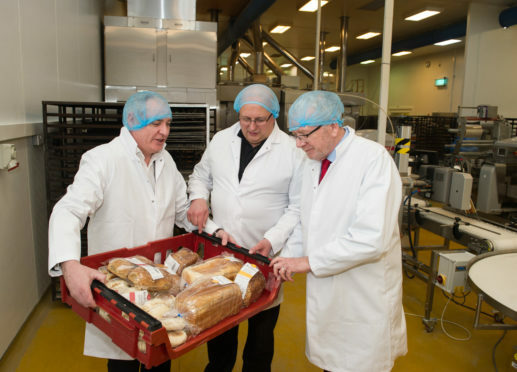 Yesterday, the Scottish Government’s Brexit secretary, Michael Russell, toured Maclean’s Highland Bakery to learn about the effect the EU split could have on the firm. And the minister believes continued uncertainty could result in some firms going under. He said: “Scottish food and drink is iconic. It’s become that because it can go into the European market with minimum of fuss. Moray MSP Richard Lochhead added: “Brexit will have a big impact on Moray’s businesses and our local economy, particularly given that many of our key industries, such as our food and drink producers, are export-based businesses and many rely on EU nationals for their workforce.